Aicon Gallery is proud to be an exhibitor at Art Dubai ( Booth B 56). The gallery will feature artists Devang Anglay, Debanjan Roy, Debnath Basu, Jayashree Chakravarti, Rathin Kanji, Sana Arjumand and Peter Drake. Art Dubai's 2008 art projects will feature new projects from leading international artists such as Wim Delvoye, Tarek Zaki, Amir H. Fallah, Sunil Gawde and Marwan Rechmaoui as well as a special exhibition of contemporary art from Pakistan curated by Salima Hashmi:"Desperately Seeking Paradise" which will take place in the Pakistan Pavilion." 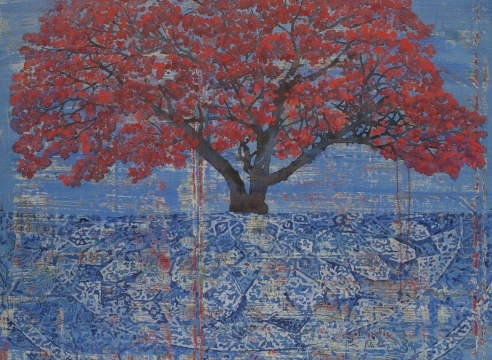 Desperately Seeking Paradise" features eleven artists from Pakistan whose work circumscribes the many pathways and many notions of paradise that possess us today. Amongst the participants are artists such as Rashid Rana, Naiza Khan, Farida Batool, Imran Qureshi and Mohammad Ali Talpur. contemporary art. Sixty years of turbulent history have only served to challenge the creative energies of artists who are now emerging on the international art scene as an innovative and creative group. This exhibition is the first in a series of annual projects that will focus on artists from across the region." Contemporary art fair. Art Park, situated in the underground car park at the Madinat Arena is a space devoted to experimental and site-specific works with a particular emphasis on video. Art Park includes projects by Idris Khan (Yvon Lambert, Paris/New York), Jittish Kallat (Albion Gallery, London) and Mohammed Zeeshan and Khalil Chishtee (Green Cardamom, London) will be on display. Video work by Susy Gomez (Horrach Moya), Lida Abdul (Giorgio Persano), and Kader Attia (Albion Gallery). The Art Park will also include the Bidoun Cinema, featuring curated video programmes with a Middle Eastern focus. The Bidoun Lounge, designed by Dubai design company Traffic, will also host a 'video bar' with continuous screenings. "Art Projects are an integral part of the development of Art Dubai and offer visitors the chance to experience major works by international artists. As part of the on-going commitment to innovative regional art, we are pleased to inaugurate the first Art Park project space that this year focuses on video work from the Middle East curated by Bidoun, alongside other international video works", says Martin. Lincoln's Inn Fields, London WC2A 3ED, E: nsukker@brunswickgroup.com, T: +44 (0) 20 7396 5317.